fiTaar فـِطا َر (breakfast) is a generally a leisurely meal eaten early in the day, either with family or with work colleagues. Because it can be very hot in the middle of the day, many people, especially those who work outdoors, do a morning's work before eating breakfast. biyD wa bastirma بـِيض و َ بـَستـِرمـَة: beef preserved in molasses and herbs, thinly sliced and fried, then made into an omelette. Some people prefer white bread, which is normally quite thin and about 15cm diameter: others prefer brown bread, which is slightly thicker, about 25cm diameter and covered with radda ر َدّ َة (bran). Egyptians eat more bread per person than any other country in the world. You will often see people queueing outside a good bakery. The bread is freshly cooked, and is still hot when you buy it. Sometimes people lay the bread on the pavement to let it cool before they carry it home. Egyptian families are large, so people take away a big stack flatbreads, or use a woven wooden frame to carry the bread. Many of the dishes are available in breakfast food shops: there are usually a couple of tables so you can eat in the shop, but most people take it away. Local businesses often phone through an order, and somebody brings everything on a large steel tray. 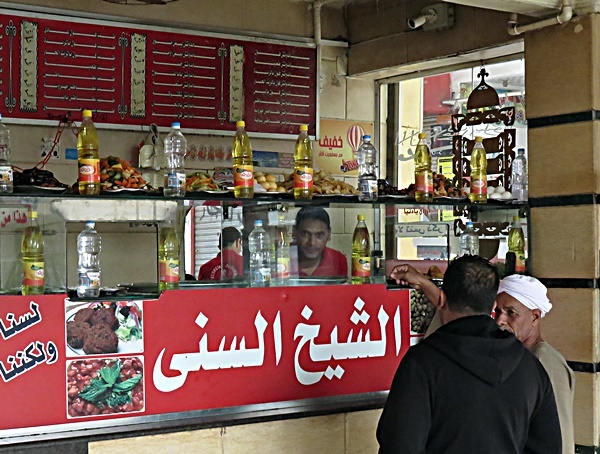 Most egyptians cannot afford to eat meat, so the typical breakfast dishes are all vegetarian. 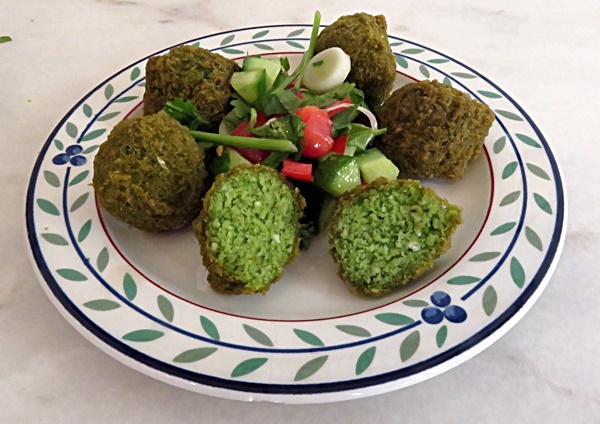 Most dishes are around a gineeh جـِنيه per portion. Another favourite at breakfast time is fiTeer فـِطير, a flaky and very dense variety of flatbread. You can buy it from shops that sell fiTyr and beetza بيتزاَ (Egyptian pizzas are made using filo pastry, the same as fiTyr). You can buy it with a selection of sweet and savoury toppings, or just plain. Fityr is often served with Taheena طـَحينـَة (sesame seed paste) and Aasal 'iswid عـَسـَل إسو ِد (molasses). The two are poured carefully into a bowl so that the tahina forms a layer over the molasses, then pieces of fiTyr are dipped into the bowl.